Canadian Eric Lamaze is back in the world number one spot for showjumping riders, according to the latest FEI Rolex Rider Rankings, which were released on Thursday. Following a sensational year in 2008 which included winning Individual Gold and Team Silver medals at the Olympic Games, Lamaze went to number one in the world. The achievement marked the first time that a Canadian has held the number one spot in the modern world rankings. Incredible success at Calgary's Spruce Meadows summer tournaments in June gave Lamaze a total of 3225 world ranking points, putting him back in the number one spot in the Rolex Rider Rankings. Former number one, Pius Schwizer of Switzerland, has fallen to second place with 3173 points while reigning European Champion Kevin Staut of France is ranked third with 3064 points. "It is the highest honour that you can receive, other than winning an Olympic or World Championship gold medal, or a World Cup Final," said Lamaze, 42, of Schomberg, Ontario. "Being ranked number one is not a one-time event; it reflects consistency over a one-year period. You need great owners and great horses to make that happen." Lamaze demonstrated that consistency during the Spruce Meadows "National" Tournament held June 9-13 when he won four days in a row in the International Ring, including Saturday's $200,000 CN Reliability Grand Prix with his Olympic mount, Hickstead, owned by Ashland Stables and Lamaze's Torrey Pines Stable. Additional wins came with Take Off, Atlete van t Heike and Coriana van Klapscheut, all owned by the Ziegler family's Artisan Farms, LLC. 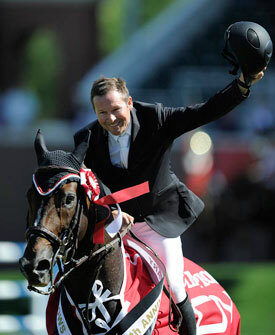 "Being number one is about the amount of good horses you have and are competing with," said Lamaze. "You can't get to number one with only one or two horses. All of the horses in our barn, including the young stock, have helped us to get to number one. They have all contributed." Lamaze is currently competing at the CSI5* Spruce Meadows "North American" Tournament, running through to Sunday, July 11. He then returns to Europe to contest CSIO5* Aachen, Germany, from July 13-17 followed by CSI5* Chantilly, France, and CSI5* San Patrignano, Italy. "I have a great team behind me that allows me to be mostly based in Europe," said Lamaze, who divides his time between bases in Brussels, Belgium, Wellington, Florida, and his home in Ontario. "I think it is great for Canada to have a Canadian in the number one position." On the long-term horizon for Lamaze are the 2010 Alltech FEI World Equestrian Games in Lexington, Kentucky, from September 25 to October 10.